Landscape Designers Tampa FL – Landscaping Tune-Ups, Inc.’s commitment to excellence and high quality work in the field has granted them a rock solid reputation with all their clients. 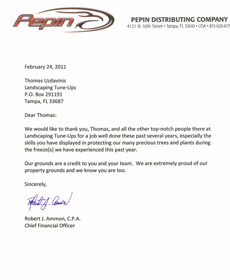 Tampa landscapers at Landscaping Tune-Ups feel so proud and valued after receiving wonderful letters from their clients complimenting and thanking them for their professionalism in everything that they do while performing their landscaping jobs. 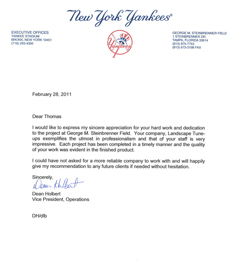 “I would like to express my sincere appreciation for your hard work and dedication to the project at George M. Steinbrenner Field. Your company, Landscape Tune-Ups exemplifies the utmost in professionalism and that of your staff is very impressive. Each project has been completed in a timely manner and the quality of your work was evident in the finished product. “We would like to thank you, Thomas, and all the other top-notch people there at Landscaping Tune-Ups for a job well done these past several years, especially the skills you have displayed in protecting our many precious trees and plants during the freeze(s) we have experienced this past year. 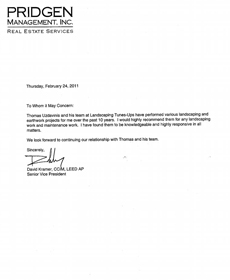 “Thomas Uzdavinis and his team at Landscaping Tune-Ups have performed various landscaping and earthwork projects for me over the past 10 years. I would highly recommend them for any landscaping work and maintenance work. I have found them to be knowledgeable and highly responsive in all matters. After reading these testimonials from our satisfied clients, now we would like you to experience the same quality and professionalism of our Tampa landscapers during the superb landscaping services that they will provide you. To have Landscaping Tune-Ups provide you with outstanding landscaping services feel free to call us at (813) 413-6325.